An online Maryland State Archives search reveals that two buildings – at 5 East Mulberry Street and 7 East Mulberry Street in the Cathedral Hill area of the city— are associated with the school, with the building at 7 East Mulberry graced with the sign. A photo of the buildings from the 1975 Maryland Historical Trust nomination form. Photo from MD State Archives. “7 East Mulberry Street has definite historical significance and should be kept in tact [sic]. One man who lives at 7 East Mulberry Street said that he was pretty sure that the front of the building was redone approximately two decades ago. From 1913 to 1937 it became headquarters for the Children’s Playground Association. It states that the same lot of ground by deed was conveyed to the said grantors (J.A. Morton and E. P. Schaeffer) by Charles J. Bonaparte, executor. There is much information on this man in the Maryland Historical Society for he became Attorney General under Theodore Roosevelt and was a direct descendent of the Bonapartes of Corisica [sic]. The fact that he was so interested in education and children enables us to relate to his taking part in making 7 East Mulberry a playground headquarters. On July 6, 1815, Philip Tilyard, a famous portrait painter and the son of Thomas Fair Wm. Tilyard from England, bought the house and own it for three years. 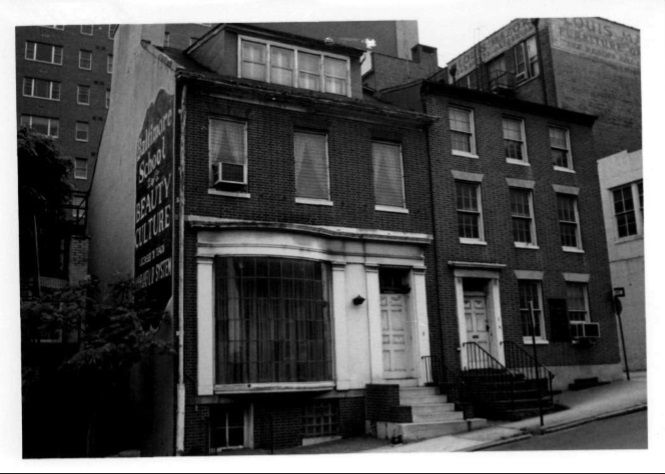 According to the Maryland Historical Trust nomination form for 5 East Mulberry Street, this taller, three-story structure was being used as apartments during the time of the Maryland Historical Trust nomination in November 1975; there was no use listed on the nomination form for the 7 East Mulberry building. The faded sign for Baltimore School of Beauty Culture boasts it was licensed to teach the Marinello System. According to the Marinello website, this system began when Ruth Maurer, the wife of a Wisconsin doctor, started creating beauty products in the 1903. Building on her success, in 1905 she started opening a chain of Marinello schools across the country to train beauticians in hair and skin care, using Marinello products. The schools were named after Giovanni Marinello, the 16th-century Italian physician credited with the advent of modern cosmetology. Marinello is still going strong after 100 years in the beauty business, with schools still operating today in several states. It is believed the Baltimore location operated for about 30 years before closing around 1970.